November 7th saw 11 folk taking a walk at Burwick to observe Grey seal pups. Penny had chosen the day well and we enjoyed dry, calm conditions for peering down from the cliff top. Over 70 pups were counted within a half-mile stretch. Their ages varied considerably; with some close to moulting and becoming independent whilst a couple of pups were new-born, one with umbilicus still attached. We were being watched by dozens of beady-sealy eyes from the water and the adult seals seemed to be as interested in us as we were with them. However, by using the cover of cliff-top grass and watching from sitting or lying positions we minimised our disturbance to nursery beaches below. 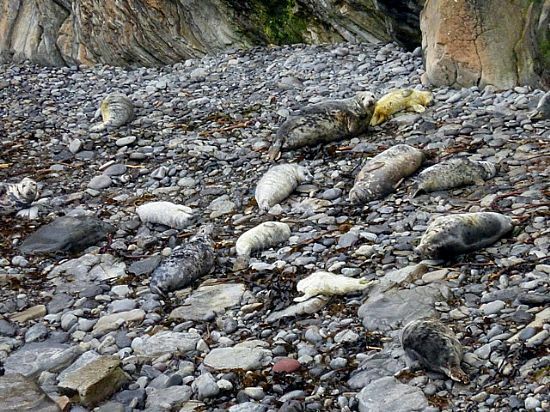 The following day (Sunday) heralded increasing winds and rain, with a particularly stormy night and many of us were thinking of the young pups on very exposed South-facing shores.